These soft and flavorful biscotti have been around for 600 years, and when you take a bite you'll know why. 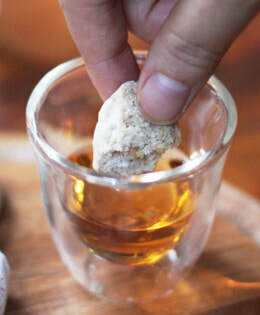 When you bite into a Tuscan cookie like Cavallucci Sienese, you’llbe tasting traces of a medieval or Renaissance past. Layered spices, honey, nuts, figs and canditi(mixed dried fruits), but not the typical dried fruit used in modern Italian holiday breads, but luscious candied fruit. Keep in mind, these are not pretty biscotti, they are both rustic and a bit boring looking on the outside, but soft, sweet, fragrant and flavorful inside, where it counts. The name can be attributed to the fact that they used to be embossed with either an image of a horse (cavallo) or a horse’s hoof. In fact, many today are shaped like a horses hoof. Some claim the cookies can be traced back to the reign of Jonah the Magnificent (1449–1492), when they were called biriquocoli. Others say that cavallucci were served to travelers and couriers on horseback (think “Renaissance Pony Express”) as a source of nourishment for long trips (something like a Medieval power bar). Some Sienese claim that these dolci were the snacks for servants who worked in horse stables of rich Italian aristocrats in the various contradi (neighborhood districts), of obvious fame for the annual Palio horse race each year. During the Christmas holiday season, they are served with wines such as Vin Santo, Marsala, Passito di Pantelleria, Asti Spumante or Moscato–dunking is perfectly acceptable and some would say, required. In turn, roll each piece into a 15-18″ rope, cutting 2-3″ pieces with a knife. Shape each into hoof shapes, then make a thumb print in each piece. Alternately, you can press the tip of an angled teaspoon into each cookie to make an impression looking like a horse’s hoof print. Place the cookies 3/4″ inch apart on the sheet pans and bake for 20 minutes or until their bottoms are lightly browned. Note: Serve with a sweet Italian wine, Amaretto or Sambuca.